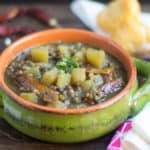 It was quite hard to find a dal recipe from Meghalaya. 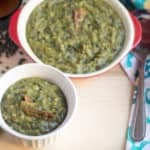 During my search, I landed upon this recipe, and when I further investigated, I found a lot of my fellow bloggers has tried this daineiiong with their variation during 2014 blogging marathon. Initially, I was planning to go with black gram dal but later decided to use masoor dal and toor dal combination. 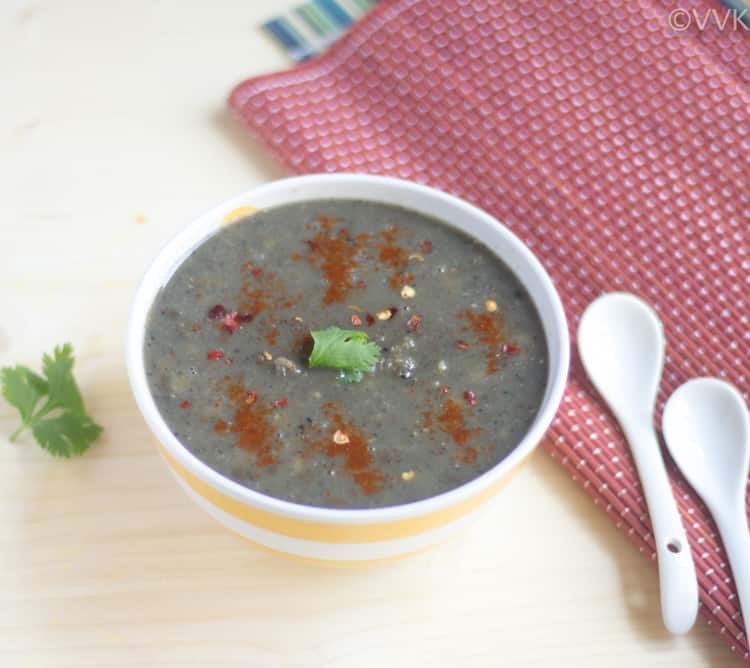 Black gram dal and masoor dal is famous in both Assam and Meghalaya. (Meghalaya was part of Assam till 1972) As I used black gram for the Assamese dal, I decided to go with masoor for this one. 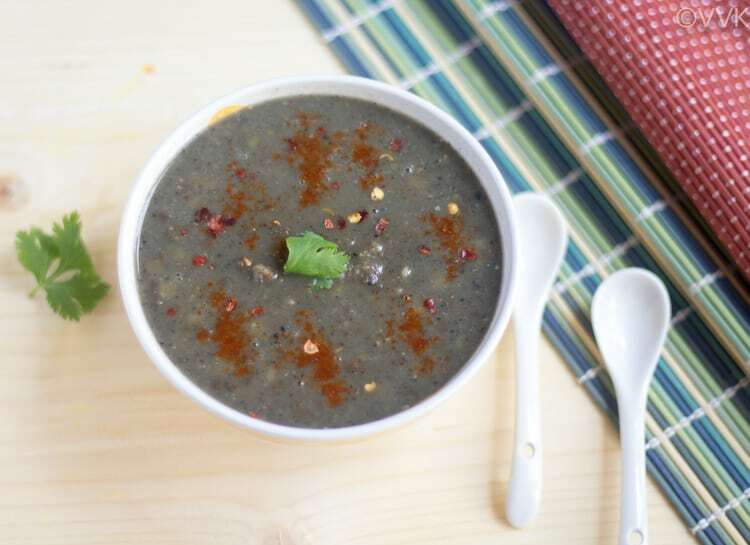 Black sesame seeds are one among the common ingredient used in Meghalaya cuisine. As I further researched, I came across this recipe doneiiong which is nothing but pork curry with black sesame seeds. All you need for this dal is lentils, water, salt, ginger garlic paste and sesame seeds. That’s all. But I did add little bit paprika as the dal was little bland for us. 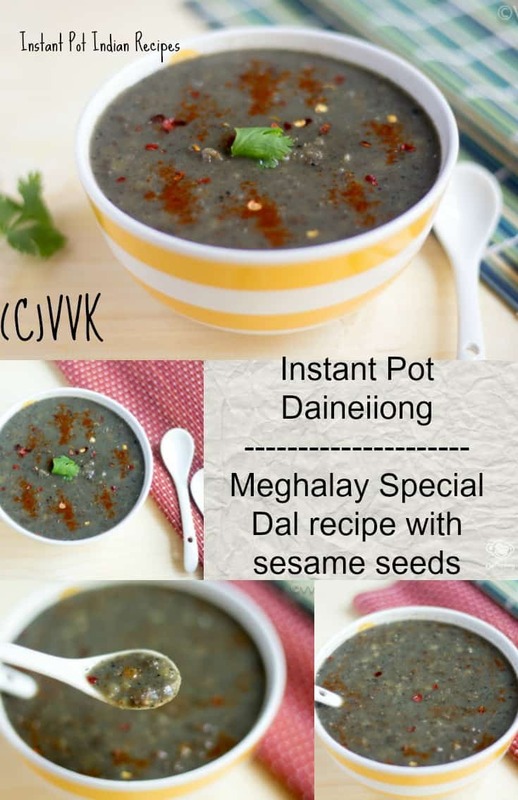 Here comes the simple, Meghalaya style dal – Daineiiong. Meghalaya style dal prepared with lentils (I used brown masoor dal and toor dal) and black sesame seeds. Wash the dals and soak for 10 to 15 minutes. Set the IP in saute mode and once it is hot, add the sesame seeds and dry roast for two minutes. Once they start to splutter, turn the IP off and remove it from IP and allow it to cool. Then grind it into a coarse powder without adding any water. Now set the IP in the saute mode and add oil. Once the oil is hot, add the ginger garlic paste. Then add the dals and saute it along with the ginger garlic paste for a minute. 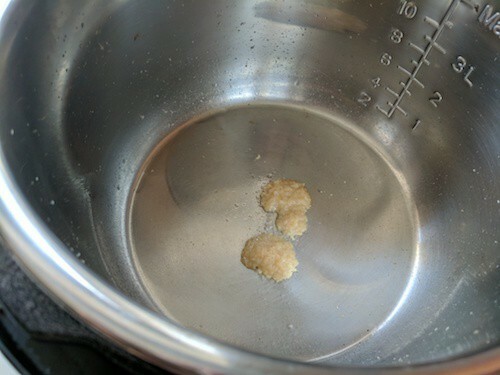 Now add two cups of water and the salt. Set the IP in manual mode and cook for 10 minutes and let the pressure release naturally. Once the pressure is released, carefully open the lid. Set the IP back to saute mode and add the powdered sesame seed powder and paprika. Mix and mash the dal nicely. Let it simmer for two to three minutes and turn off the IP. That’s it. Daineiiong is ready. Serve hot with rice. Heat a pan or kadai and once it is hot, add the sesame seeds and dry roast for two minutes. Once they start to splutter,turn the heat off and allow it to cool. Meanwhile, pressure cook the dal by adding two cups of water for three whistles and let the pressure release. Once the pressure is released, mash the dal nicely. Heat the kadai and add oil. Once the oil is hot add the ginger garlic paste. Saute for a minute and add the cooked dal, powdered sesame seeds, paprika, and salt. Mix them all and let it simmer for 5 minutes. 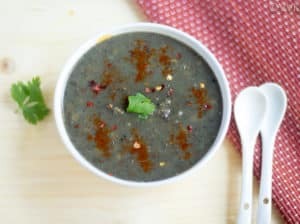 You can any single dal or mix and match as per your preference or just use black gram dal. The original recipe doesn’t call for paprika, but I included just for additional spice. That's it. Daineiiong is ready. Serve hot with rice. The original recipe doesn't call for paprika, but I included just for additional spice. 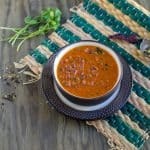 I have never seen a dal in this color. Very different recipe. Chilli powder sprinkled on the dal makes it so tempting. Simple spices and it looks so yummy. Reminds me of Chatang or Tea Soup that I made for Indian States. This sounds much more delicious. 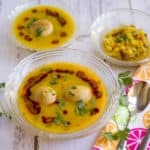 Your blog is becoming a treasure to check if we are looking for different style of dals, this Megahalaya dal looks fabulous with dark colour, never seen a dal in this colour, am curious to make some soon. Sesame with dal is such a never tried combo in south Indian cooking and love your effort for the R & D and bringing so many unknown dishes to us !! As I said you really made the NE states dal sound so easy to make..I remember the struggle we had while doing that Edition..this is a good one to try! 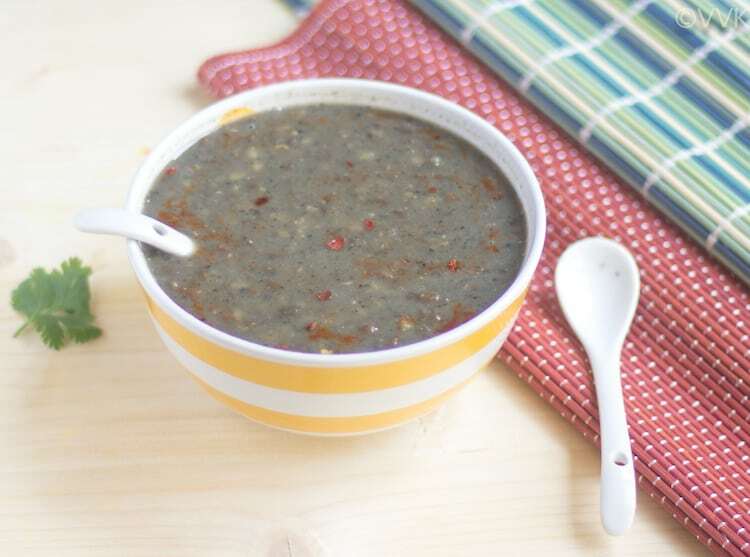 The black sesame must make this dal so flavourful. Love the different look of the dal.. The East Indian cuisine is absolutely bland . On our trip to East I carried plenty of food , but then they have that fire red chilly which can give you the kick ! 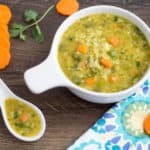 You have really gone deep into these traditional lentils and now I know where to look for them . :-) Thanks much Vaishali. Hearing that from you made my day. Adding black sesame seeds makes this dal more interesting. Glad you found a dal from Meghalaya, it’s hard to find , right?